The story of Zeke Sardina, the severely disabled Buffalo boy born to a homeless mother and adopted by a Southern Tier family, has resulted in such an outpouring of support that the family is starting a website to inspire other would-be parents to foster or adopt children with disabilities. "I’ve been contacted by people I haven’t heard from in years," said mother Sarah Sardina, who opened the door Sunday evening to see members of the Houghton College girls field hockey team on her doorstep with a prepared dinner for the entire family. 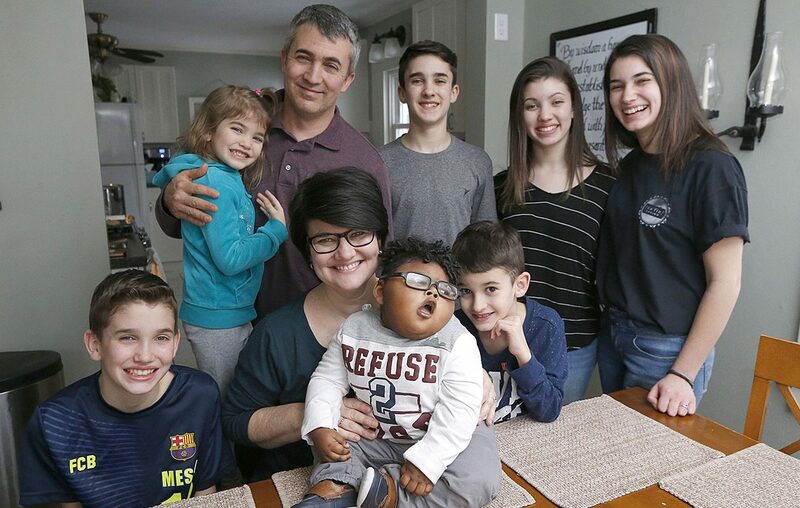 The Buffalo News story about Zeke and his journey with his adoptive family was published earlier this month. Zeke recently was suffering from an infection that sent him to the hospital for two nights. The Sardina family, which includes six other children still living at home, has subsequently been beset by several other minor illnesses, but their spirits have been lifted by the positive feedback they have received. Sarah Sardina created a web page, www.zekeshome.com, designed to give other prospective parents resources and hope when it comes to adopting and caring for a high-needs child. The completed website, which will launch on Zeke's birthday on April 28 and features photos taken by Buffalo News photographer Robert Kirkham, will chronicle the family's journey with Zeke and offer stories of inspiration from other parents who have adopted and raised special needs children. "There are so many people who have done things that are so much bigger than what we’ve done," Sardina said. "I want their stories to be shared, too." Zeke was adopted by the Allegany County family in December. 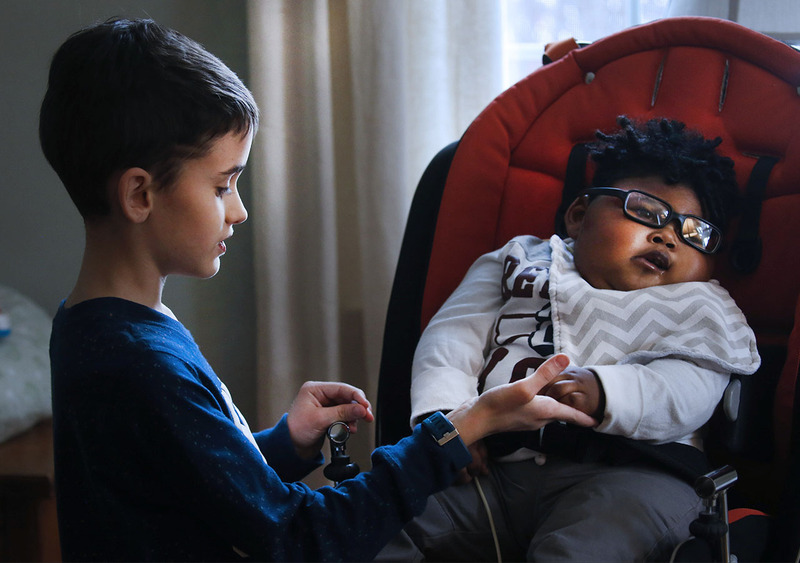 The News chronicled the heartbreak and joy of Zeke's story since birth and the challenges facing the Sardina family, who has come to love him. Since then, readers have clamored for ways to offer the family support, with strangers dropping checks in the mail or writing the family to let them know that their story has motivated them to move forward with their own fostering and adoption plans. The extended family received so many requests to donate that a relative has set up a separate GoFundMe page to help cover Zeke's future equipment needs and renovations needed to make the Sardinas' house more handicapped-accessible. When reached by The News, Sardina's voice sounded scratchy and groggy. Part of that came from a lingering cold and part came from the fact that Zeke, who turns 3 next month, has been waking up in the middle of the night this past week, shrieking in pain and leaving family members sleep-deprived. Shortly before the article ran, Zeke was admitted to Oishei Children's Hospital for two days due to hypothermia. His temperature eventually stabilized, but he remained unhappy and cranky after he returned home. The Sardinas eventually discovered some pus coming from his feeding tube, which had become infected. Zeke has been taking medicine to control his acid reflux, but by reducing that acid, other stomach bacteria had the chance to grow, leading to both an infection and gas, Sardina said. Zeke is now taking three different antibiotics and slowly improving. Saturday night was the first night he slept for seven hours straight, Sardina said, though he still woke up shrieking. Meanwhile, son Jonah, 8, had the stomach flu last week, and 4-year-old Eden came down with the croup. "It’s been a crazy week," Sardina said. "Everybody had something different." But family members are still excited about the prospect of contributing to a website that might encourage others to "embrace life" and consider whether their family has the capacity to love a disabled foster child looking for a home. "I will admit, it is not a common thing," Sardina said. "We are weird. But hey, the need is out there."